He goes on to write, Therefore, in order to keep me from becoming conceited, I was given a thorn in my flesh, a messenger of Satan, to torment me. 8 Three times I pleaded with the Lord to take it away from me. 9 But he said to me, “My grace is sufficient for you, for my power is made perfect in weakness.” Therefore I will boast all the more gladly about my weaknesses, so that Christ’s power may rest on me. 10 That is why, for Christ’s sake, I delight in weaknesses, in insults, in hardships, in persecutions, in difficulties. For when I am weak, then I am strong. Do you have a weakness, a thorn in your flesh? When I was 16, and weighed 116 pounds, I thought it was my weight. Yeah, I thought I was fat at 5′ 2″ and 116 pounds, and so did my parents and classmates. Then I entered Mother Teresa’s convent wanting to become a nun, where, to prevent illness, and excessive fasting, there were fixed quantities of food one had to eat. 5 chapatis for breakfast (with oil, donated by US Aid) poured on top of them for breakfast, and 5 ladles of rice for lunch and dinner. I left 14 months later weighing 121. Stayed at home, reading, waiting to go to college. 126. Went on to college, and graduate school. Got married in 1989 weighing 140. The pill didn’t work for me. Gained 27 pounds the first year of marriage, partly because I spent it sitting and reading. About 20 for each pregnancy. And then another 20 after resuming a sedentary life of blogging, reading and writing. And so yesterday, I step on the scales, which I have been avoiding for months, while the tightening of clothes told their own tale. Yikes, we’ll have our 22 wedding anniversary next month, and I have gained 86.5 pounds in the course of our marriage. Yes, it’s true. And here is my wedding picture. And I suppose, if I do nothing, I will steadily go on gaining weight. Don Miller here writes about losing more than 150 pounds. He writes, “It’s been an incredible journey.” He tells us of it in A Million Miles in a Thousand Years. He was fat, something like 190 pounds overweight–a fact which, in a sense, defined his life. He had tried to lose weight–but lacked the motivation. In a sense, he could not see “a story” in which he was thin. Then he meets a girl, who gives off no friendly signals. He asks her if she would like to hike the Inca trail to Macchu Piccu (gruelling, 14,000 feet up, then down again, then 12,000 feet up, down again) challenging even for those in peak physical condition–and you need to be in peak physical condition to attempt it. She agrees. They commit to going with a group. And Donald Miller is like 190 pounds overweight!! Suddenly, he has a story. And if he doesn’t lose weight and get fit, it ends in tragedy. So he goes to a gym, gets a sympathetic trainer, and loses over 150 pounds. Yesterday, I wrote a list: Why do I want to lose weight? And you know, I found some reasons, but none were truly compelling. I could sign up for the Milford Trail, the Appalachian Trail (and have walked some of both of these) or the Inca Trail, but, you know, walking for much more than an hour at a stretch bores me. Yeah, sorry, but it’s true. But without a story, without seeing the beginning, the middle and the end, without a tangible goal, I am unlikely to persist for more than a few weeks. About ten years ago, I published an article on prayer in The Christian Century. And then, I was asked to speak at a women’s breakfast, a women’s banquet, to women’s groups. And I spoke on….Prayer. Prayer is indeed one of the great experiences and adventures of my life. Perhaps I need what Don Miller calls “an inciting incident.” Perhaps I need a story. So I guess, I am going to write one. Create one. 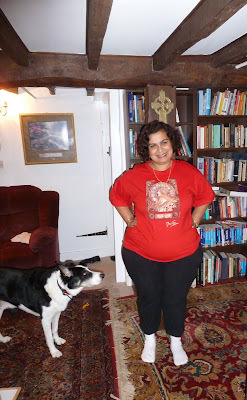 Chart–on this blog–my attempts to lose weight with my whole heart, soul, mind and strength. Through prayer, fasting, exercise, and a healthier diet. I anticipate spiritual growth in the process, as well as physical shrinkage, and will report on both. Do follow me 🙂 More tomorrow. @ Jennifer, What an AMAZING prayer. I would be so grateful if you prayed it! So–my prayer will be that the same passion and love and focus you have for writing can be also put toward healthy eating/exercise/diet! @ Jennifer. Thanks so much for the encouragement. Yes, do check in on my progress. I've never managed to focus on weight for more than a few weeks. @ Ray, am looking forward to increased energy! Your wedding picture — simply, absolutely, gorgeous. what a beautiful bride, and handsome groom, too. Good luck Anita. I know how hard it is to lose weight, but it is so worth-while and a tremendous boost for energy levels. It took me 20 years to accumulate an excess 5 stones and 2 and a half years to lose it. Hard going but it is not going back on ever!